In the 7th century AD, a Muslim Jihad had spread out of Arabia across the Mediterranean world, conquering about half of the Christian world, including the holy city of Jerusalem. The early Muslim rulers of this vast empire were relatively tolerant of Christianity and Judaism, which were seen as other Abrahamic faiths, preferable to Paganism under Islamic law. The Christians and Jews were thus given permission to practice their religion as long as they paid the Jizya, a special tax levied on non-Muslims. From the 7th to the 9th centuries, the Christian world was comparably weak and unable to recuperate any of the territories lost to the Muslims. However, by the 10th Century, the Christians began to recuperate and reclaim these lands. The first areas to be reconquered were the islands of the Mediterranean, owing to the Christian World's growing superiority in naval technology and expertise. Cyprus and Crete were recaptured by the Byzantines in the 10th century, and the islands of the Western Mediterranean: Sicily and Malta were reconquered by western Christian forces in the 11th Century. At the same time, the Christian reconquest of Spain began to gain momentum. At this time, the Seljuk Turks, a people that had originated in Central Asia and migrated into the Middle East, adopting the Islamic faith, began to conquer much of the Near East. The Seljuk Turks conquered much of Anatolia from the Byzantines and also Syria, Palestine, and Jerusalem from the Arabs. Under the Seljuk Turks, Christians began to be persecuted more and more for their beliefs. In 1095, the Byzantine Emperor Alexios I wrote a letter to Pope Urban II in Rome requesting military support from Western Europe against the new Muslim Menace: the Seljuk Turks. In his letter, Alexios I described in graphic detail how the Seljuk Turks were torturing Christian pilgrims in Jerusalem. Pope Urban II responded to the letter by calling upon Christian kings and knights all over Europe to wage a religious crusade to recapture the Holy Land from the Turks, beginning an epic 200 year struggle known today as the Crusades. 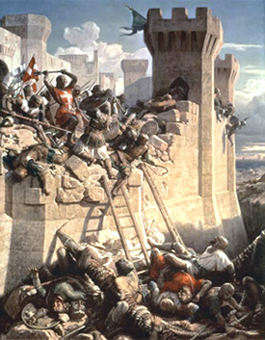 During the First Crusade, the Christians successfully recaptured Jerusalem after a long siege. (see map 1) Some of the Muslim and Jewish population of the city was massacred. The sources do not agree on exactly how many were killed, but certainly the deaths were in the thousands. It should be noted that the massacre of the inhabitants of a city that refused to surrender was common practice in this era. The conquered territories of the First Crusade were divided into a set of Crusader States all along the coast of the Levant: the County of Edessa, the Principality of Antioch, the County of Tripoli, and most importantly, the Kingdom of Jerusalem (see map 2). However it was soon learnt that the hardest part of crusading was not capturing territory in the first place, but defending it in the long run against a patient enemy in foreign, unfamiliar lands. The first of the Crusader States to be retaken by Muslim forces was the County of Edessa, which was overrun by the Seljuk Turks in 1144, prompting a second crusade, whose aim was to capture the Seljuk capital at Damascus. (see map 3) The Second Crusade failed in this primary objective, nevertheless, the Turks were unable to gain any further leeway in capturing the other Crusader States. Saladin has traditionally been viewed in the West as an unusually kind-hearted conqueror. The Koran specifies that Islamic soldiers are entitled to 4/5ths of all spoils of war procured during Jihad and the remaining 1/5th is to be taxed by the Muslim ruler to be used for governing and for distribution to the needy (Koran 8:41). Saladin's men considered the Western Christian inhabitants of Jerusalem, including the women and children, as part of the spoils and demanded that they be entitled to take them as slaves or to be used as hostages for ransom. Saladin freed his share of the captives and paid his men the ransom prices for some of the poorer captives using his own personal wealth, the vanquished Christian rulers of the city also paid for the release of some of the poorer captives. In this way, Saladin's men were placated, Islamic law was not violated, and many of the Christians were freed. However the money was not sufficient to free all of the Christian inhabitants and many were taken as slaves. The aim of subsequent Crusades was not Jerusalem itself, but Egypt. Egypt was were the threat to Jerusalem really lied, the Crusaders figured that if they could quash the forces of Egypt once and for all, it would then be much easier to hold on to Jerusalem. A Fourth Crusade to conquer Egypt was planned, but never arrived due to infighting between the Western European Crusaders and a new Byzantine Emperor who had originally agreed to fund the Crusade but then reneged on the agreement. Both the Fifth and Seventh Crusades were successful at taking the Egyptian port city of Damietta, but then got bogged down dealing with disease and desertions before reaching the Egyptian Capital of Cairo. 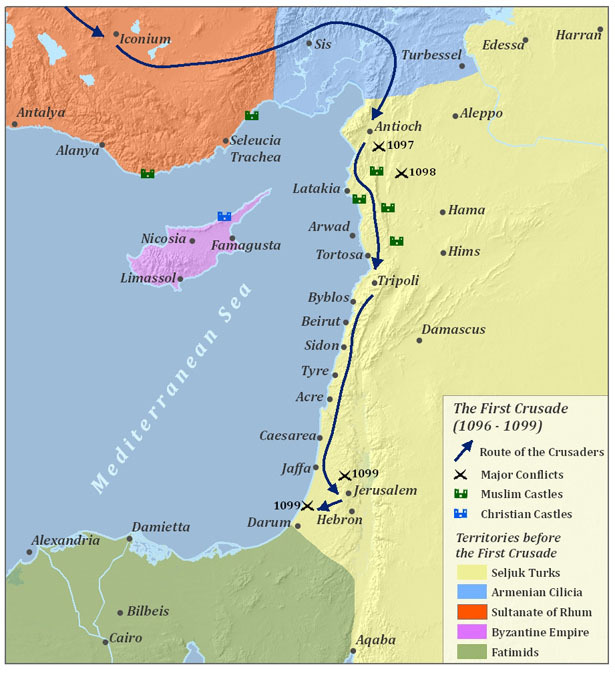 (See map 7) The Sixth Crusade involved no real fighting, instead the Holy Roman Emperor Frederick II was able to negotiate with the Egyptians to cede Jerusalem and sign a 10 year peace. Once the 10 year peace expired, Jerusalem fell to a Muslim force almost immediately. Once the Mongol threat was overcome, the Egyptians turned their attention back to ridding the Near East of the Crusaders once and for all. Led by Baibars, the Egyptians engaged on a merciless campaign into the crusader territories. On numerous occasions, Baibars promised the defenders of cities and castles that they would be let go after surrendering, only to be massacred or enslaved once the city gates were opened, some cities were completely destroyed. (See map 7) When Baibars captured the city of Antioch in 1268, he had 17,000 of the Christian population massacred. A few cities and castles were too well fortified for Baibars to capture and their location on the coast meant that they could be easily resupplied from the sea. Nevertheless, Europeans began to lose interest in the elusive goal of recapturing the Holy Land and popular support for paying the taxes necessary to sustain these last crusader strongholds quickly dwindled. One by one they were picked off by Muslim forces. The last three cities to be taken were Sidon, Tyre, and Acre in 1291 AD. Jerusalem would remain under Muslim rule until it fell under British Mandate in the Twentieth Century.